Lauren Fitzgerald, 14, from Middleton High School, carries a sign in the Capitol to protest gun violence at a rally on March 14, 2018. 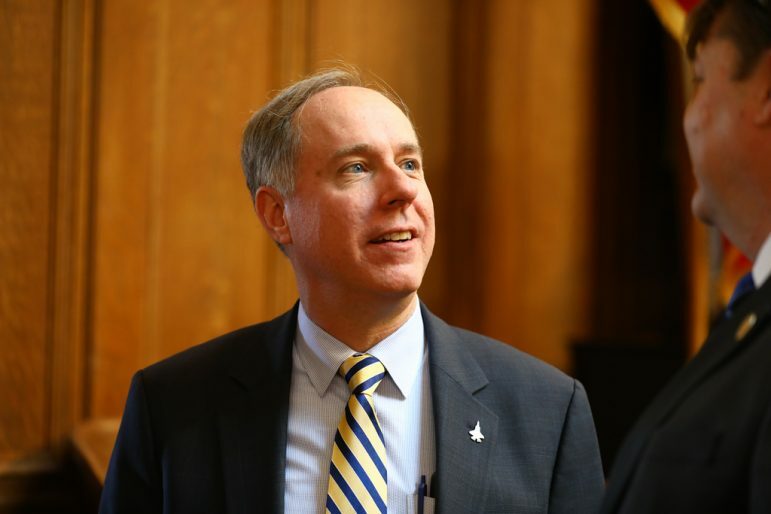 Amidst calls for tighter gun restrictions, Assembly Speaker Robin Vos, R-Rochester, addressed the notion of self-defense in a February claim, stating, “I certainly believe there are an awful lot of folks who are law-abiding who have done nothing wrong who could probably defend themselves.” The Observatory found his claim mostly false. 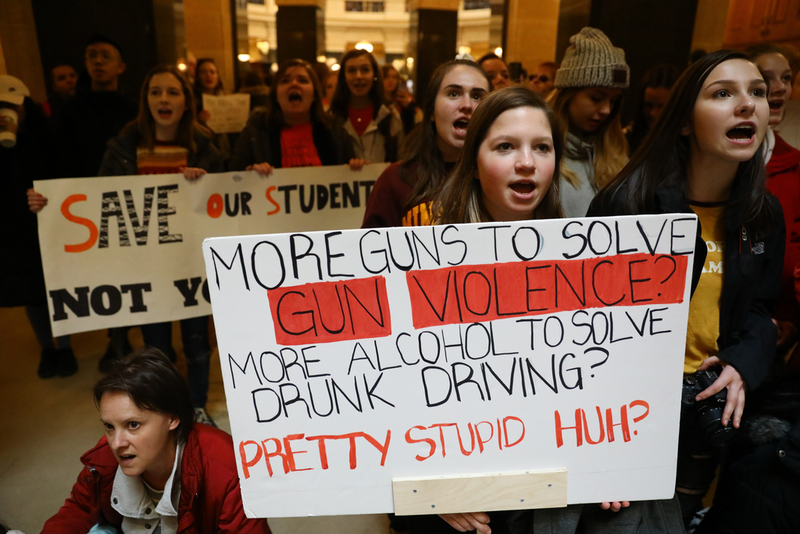 Following the Feb. 14 mass shooting at Florida’s Marjory Stoneman Douglas High School that left 17 dead, Wisconsin lawmakers faced pressure on gun control. The Observatory contacted Vos and his spokesperson for comment, but they did not respond. Data from the Bureau of Justice Statistics, Pew Research Center, the Violence Policy Center and the National Bureau of Economic Research illustrate that instances of citizens using firearms for self-defense are uncommon and that proliferation of guns has led to more violent crime — not less. In a 2017 survey of current and former U.S. gun owners, Pew found that a large majority of citizens in both groups never used a firearm to defend themselves, their families or possessions. It found 17 percent of all gun owners surveyed said they had used a firearm for self-defense. Meanwhile, BJS findings from its 2013 report on firearm violence indicate that Americans rarely use guns in instances of self-defense. Using data from 2007 to 2011, BJS found that guns are not used in self-defense or as a threat in 99.2 percent of violent attacks in the United States. Of the 29.6 million instances of violent crime, 43.8 percent of victims offered no type of resistance while 26.2 percent of them resorted to non-confrontational tactics. In terms of self-protective threats or attacks, 22 percent did so without a weapon, while 0.8 percent used firearms. Assembly Speaker Robin Vos, R-Rochester, is seen at the State of the State address at the Wisconsin Capitol on January 24, 2018. Statistics show that arming citizens is an ineffective strategy for combating gun violence, contradicting Vos' claim that armed citizens can probably defend themselves. Additionally, a 2017 report for the National Bureau of Economic Research by Stanford Law Professor John Donohue found that 10 years after states enacted right-to-carry concealed firearm laws “violent crime is substantially higher … than would have been the case had the RTC law not been adopted.” Donohue’s study examined 33 states, including Wisconsin, that passed RTC between 1981 and 2014. Wisconsin passed its concealed carry law in 2011. His findings show that violent crime rates were higher in RTC states than rates in non-RTC states. Depending on how it is measured, Donohue found that in 31 states with 10 or more years of data, RTC laws were associated with an average increase of between 12.3 percent and 14.3 percent in violent crime. Donohue’s report also illustrates that guns as a means of American self-defense are somewhat ineffective. He cited a study by the FBI which looked at 160 incidents involving active shooters. It found that nine law enforcement officers were killed and 28 injured in 21 of the 45 instances in which officers engaged in shootouts. Recent mass shootings at Pulse nightclub in Orlando, Florida, and in Parkland involved armed on- or off-duty police officers who either did not engage the shooter or shot at the perpetrator but failed to stop him. The FBI study found one instance of a civilian stopping a shooter, but that civilian was an active-duty Marine. “In any event, the use of a gun by a concealed carry permit holder to thwart a crime is a statistically rare phenomenon,” Donohue states in the report. 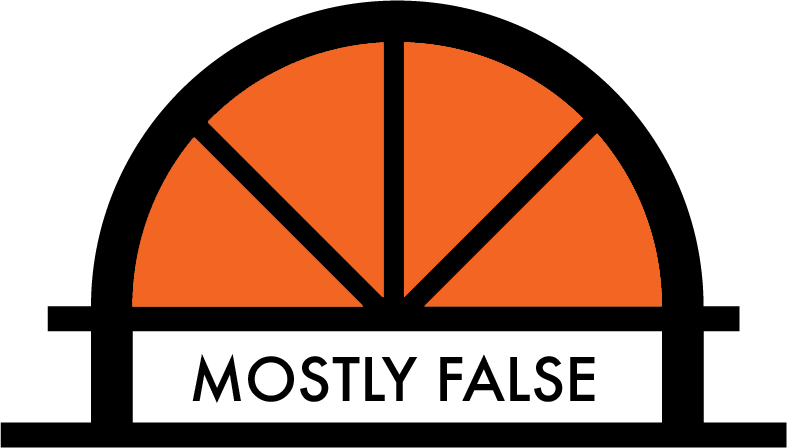 Vos’ trust in the public to defend against an active shooter is misguided. While there are instances in which an armed citizen uses a weapon to stop a mass shooter, the higher violent crime rates among right-to-carry states after 10 years indicates that less restrictive gun laws contribute to more violent crime. And statistics show that arming citizens is an ineffective strategy for combating gun violence.